Most people have heard of Mount Kilimanjaro, the highest mountain in Africa, and there is a well trodden path to the top. But who has ever heard of Nanda Devi, at 25,643 feet the highest mountain entirely within India and considerably higher than Kili? Of course, there is considerable competition for high peaks along the 2,500-kilometre stretch of the Himalayas, but until Sir George Everest discovered the highest mountain in the world Nanda Devi was thought to be just that. You can’t climb it, as the mountain is sacred. One story goes that Shiva, the great Hindu god, appeared in human form to marry Nanda, the daughter of a king, and they lived in the mountains together. 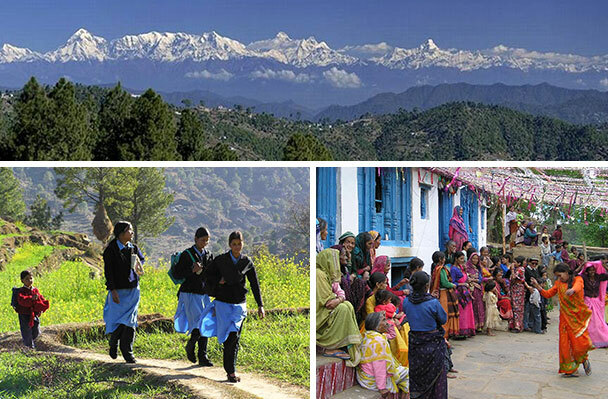 The area of Kumaon west of Nepal is little known outside India and receives very few tourists, but this is where we offer a village walking experience with incredible vistas of Nanda Devi and the foothills of the Himalayas. The area did achieve some notoriety back in the 1960s when Bob Dylan and Cat Stevens visited Crank’s Ridge or Hippie Hill, as it is known locally, in order to meet notable western Tibetan Buddhists who had settled there in the 1920s. It also happens to be where some of the best ganja in India grows wild. Having just spent a week in the area I can see why so many of the hippie generation came here to seek their spiritual nirvana. It simply does have a very special aura. It is quite an adventure to get here from Delhi: a good five-hour train journey followed by a few hours of twisty roads; but as you set off on your first walk through sleepy villages, listening to the temple bells ringing in the clear mountain air, all that is quickly forgotten. The design of the village houses you stay in is exemplary as is the attention to detail from the staff, with food to match. The variety and creativity of ways in which the cooks prepare vegetable dishes means after only a couple of days in India I often become a vegetarian. At times we walked through impossibly lush terraced valleys with Himalayan red cedars, oaks and wild peach trees in full blossom. Later, there were deep green hillsides splashed with red from the rhododendron trees and tiny flashes of blue from the Verditer flycatchers darting in and out of the flowers. Walking is the best way to get to know a place like this: the temples which greet you at every turn, women doing the work, kids playing cricket on the tiniest terraced strip, characterful pashmina goats clinging to vertiginous slopes, miniature haystacks tied to the trees containing precious larders of grain for sustenance during the winter months. 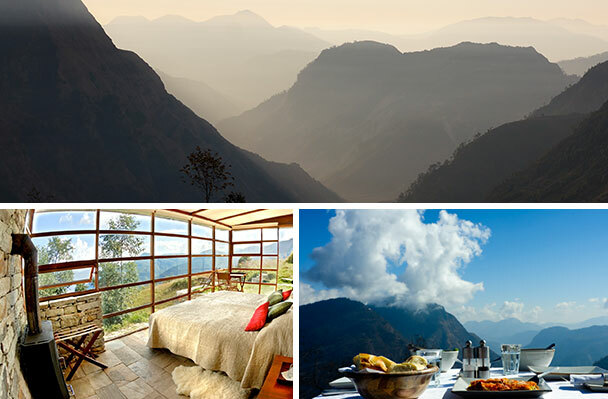 Even closer to the majestic peaks is Leti 360°, a small four-bedroomed luxurious lodge in a seemingly impossible location; a stay here combines perfectly with a few nights in the village houses. It is here that the elusive snow leopards live, but you are more likely to see the Bhotiya dogs bounding about herding sheep and looking rather splendid with their thick and fluffy coats. Only recently has a road of sorts led to these valleys, and there are still some older people living here who have never left these hills. A holiday here is about engaging gently with local culture in an unscripted way but above all it is a place in which to slow your mind and absorb the incredible scenery…. actually best achieved when a beautifully laid out morning tea tray is brought to you in bed where you can linger, wrapped up in a pashmina blanket, and contemplate the view of the mountains and the sacred peak of Nanda Devi. The village walks and Leti 360° are open from October to mid-April each year. A similar experience operates in the Sikkim-Darjeeling area and in Ladakh, a higher altitude Himalayan region which one can visit from mid-May to early October. 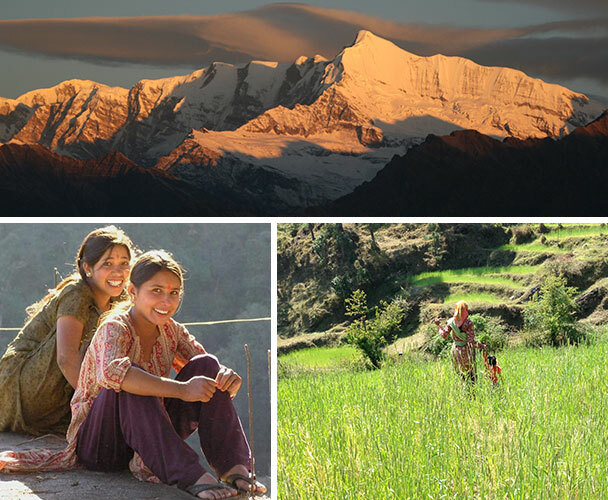 You are guided exclusively with highly experienced and informative guides who look after every aspect of your journey through the Himalayas. The houses can sleep between two and six people. Prices vary accordingly.